Do you require Certification to ISO/IEC 17025? Add Durometer Test Stand for Increased Repeatability. 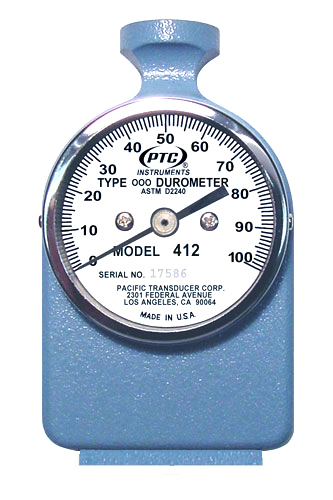 The PTC® Classic Style Type OOO Durometer comes complete with test block and carrying case. This instrument is designed to be used handheld or with PTC's Deadweight Test Stand model 470. Shore OOO Scale measures the hardness of very soft materials, suit foams, sponge rubber, open and closed cells, human & animal tissue. 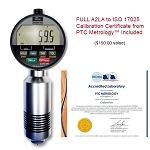 For a complete calibration check of mainspring, and visual and mechanical check of indenter, the instrument should be returned to PTC® (see Guarantee &Calibration Service) or refer to ASTM D2240 Specifications. PTC® recommends the unit be returned at least every 12 months for this check. For a quick field check, follow the guideline below. Under no circumstance should a test block be used as a standard to calibrate a durometer. 2. Hand hold the durometer and insert the indenter into the hole of the calibrated test block. Apply enough force to make firm contact between the top surface of the test block and the base of the durometer. The dial reading should agree with the value stamped on the check block (±1). Several tests should be made and the results averaged. 3. The indenter must protrude 0.098 to 0.100 inches below the base of the durometer.